Race conditions in software are when two concurrent threads of execution access a shared resource in a way that unintentionally produces different results depending on the time at which the code is executed. For example, a multi-threaded program may spawn 2 threads that have access to the same location in memory. Thread #1 might store the value 300 in this location and expect it to still be 300 a few instructions later. Since thread #2 is executing at the same time as thread #1, thread #2 may overwrite the memory location with another value while thread #1 still expects it to be 300. Sometimes it will happen, sometimes it will not. 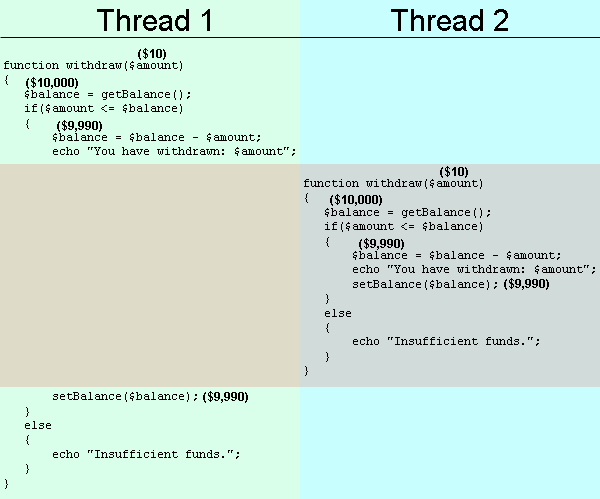 It depends if thread #2 is "lucky enough" to execute just after thread #1 wrote the value 300. Another example: Suppose Alice, Bob, and Carol have accounts at an online banking service. Alice, Bob, and Carol each have $100 in their accounts. Alice and Bob both transfer $10 to Carol at the exact same time. The web server starts processing Alice's transaction first. The server checks that Alice has sufficient funds in her account then gets Carol's balance into a local variable and adds $10. The next step would be to deduct $10 from Alice's account and then store Carol's updated balance in the database, but the web server decides to pause the execution of Alice's transaction and work on Bob's. Bob's transaction runs to completion, decrementing his balance $10 and incrementing Carol's balance by $10 (remember that Carol's balance in the database was still $100, Alice's request hasn't changed it yet). Now Carol has $110 in her account. The web server goes back to processing Alice's transaction. The variable that holds Carol's updated balance still has the value $110, so the web server sets Carol's balance to $110 unaware that Bob's transaction had already added $10 to Carol's account, and Carol ends up with $110 but Alice and Bob each lost $10. You wouldn't normally think that a web application written in PHP (which doesn't even have multi-threading) would be vulnerable to race condition attacks, but they can be. Computer programs seem to execute simultaneously, but unless you have multiple processors or a multi-core CPU, they actually don't. What really happens is that the operating system shares the CPU time between processes and threads. The OS will start some process executing, then a few microseconds later will let some other process use the CPU. After that process has been executing for a few microseconds, yet another process gets its turn to use the CPU. Doing this shares the CPU with all running processes, and makes it look like everything is running at the same time. Wikipedia has an excellent article on computer multitasking. Consider the following PHP code for withdrawing money or credits from some kind of online account. Suppose getBalance() and setBalance() are functions that load/store an account balance from a MySQL database. Just get the balance, see if there is enough money in the account, and if so, proceed with the transaction and deduct the amount from the balance. Easy, right? Wrong. This function, even though it executes in less than half of a millisecond on my PC, is vulnerable to a race condition attack that allows an attacker to withdraw funds without decreasing the balance. The attack is practical and can even be executed over the internet. These tests were done using the VPS that hosts this website (Debian 6, running Apache 2.2.16) to host the withdraw script and my Debian 6 PC at home to run the Python script. I've also confirmed that the attack works just as well when the withdraw script is hosted on the same PC that executes the Python script. It works when they're separated by a 100mbps Ethernet LAN, too. You can download all of the proof of concept files here. Table 2. Results with random delay. Don't use this method. Unless you use a CSPRNG to generate the random delay time, an attacker can probably extract the weak PRNG's state, compute the future delay times, and delay his own queries so the withdraw function executes at the same time. The attacker can also increase the number of simultaneous queries to improve the chances of the withdraws occurring simultaneously. The long delay will annoy users, too. In the call to sem_get, "1234" is the semaphore key (identifier) and "1" is the maximum number of threads/processes that can "acquire" the semaphore at once. If a thread has acquired semaphore 1234 but hasn't yet released it, and another thread calls sem_acquire on the same semaphore, the call will block until the first thread releases it. This prevents the race condition attack. I've combined the System V semaphore functions and the file lock method into a single cross-platform Mutex class that you can download here. Table 3. Results with System V semaphore. If you are using an ACID-compliant database, which guarantees atomicity, then the critical sections can be implemented as atomic database queries. Beware, however, of TOCTTOU bugs: any code not inside a database query will still be subject to race conditions. You really do need to be careful of what guarantees your database provides! If implemented correctly, it is almost certainly better than using a lock. Thanks to Tiemo Kieft for pointing me to this solution. If queries are being processed by more than one server, the System V semaphore method won't prevent the attack. Different semaphores will exist on each server so they won't help if an attacker floods each server with queries. To implement a multi-server mutex you'll need to give each server a common file system and use the file lock method, or use the locking mechanism provided by your database software. "On Race Condition Vulnerabilities in Web Applications" - A 2008 paper on nearly the same subject.